With a stay at Ve.N.I.Ce. Cera Palazzo Gardella in Venice (Dorsoduro), you'll be a 4-minute walk from Peggy Guggenheim Museum and 15 minutes by foot from St. Mark's Basilica. The front desk is staffed during limited hours. Located in San Teodoro, Villa Andrea is a 5-minute drive from Lu Impostu Beach and 8 minutes from La Cinta Beach. Free self parking is available onsite. With a stay at Le Campane, you'll be centrally located in Siena, steps from Palazzo Chigi-Saracini and Accademia Musicale Chigiana. When you stay at Erasippe Residence in Locri, you'll be 10 minutes by foot from Locri Epizephiri National Archaeological Museum. A roundtrip airport shuttle is available for a surcharge. When you stay at Case Corona in Santa Flavia, you'll be near the beach and 10 minutes by foot from Mount Catalfano Park. A roundtrip airport shuttle is provided for a surcharge (available 24 hours). 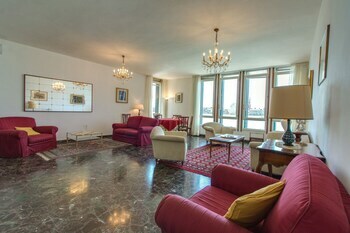 A stay at this apartment places you in the heart of Milan, within a 10-minute walk of Piazza del Duomo and Cathedral of Milan. Self parking (subject to charges) is available onsite.